It boils down to whiny non-smokers and inconsideration smokers. So says Cory Vaillancourt. Now it?s a matter of voting with our dollars. A few weeks ago, Jay Stevens? excellent article on Erie?s attitude about smoking graced our cover. In the very first sentence, he dropped a bombshell ? The crooked i was going non-smoking. As a music lover, and a smoker, I?ll have to admit that I was horrified, and I had to read it again to be sure it wasn?t the Steven King version of the Erie Reader. The crooked i has become one of my favorite bars in Erie over the past year or so because of their dominance in presenting talented musicians, and their tolerance towards those who smoke. Oh wait, those ?Fat Elvis? shots they make with the peanut butter are pretty good, too. And they have this Agwa de Bolivia stuff that is somehow not yet illegal? Sorry, I got a bit off track there. The coolest thing about Jay?s article, in my opinion, was the intense debate it stirred up both on our website, and on our Facebook page. Whiny non-smokers and inconsiderate smokers went at it for several days; I think I may have even threatened to start randomly slapping the obese (in a misguided act of retribution) or intentionally blowing smoke on passersby for being banished to the sidewalk outside. Meanwhile, Stevens wants smoking to be a felony. Jokes, people, they were jokes. All of them. At least, I think they were. But what wasn?t a joke was the idea that one of my favorite bars in town just became slightly more inhospitable to me and my accursed kind. Now, don?t start making unsubstantiated generalizations about where I?m going with this. If you think I?m going to be critical of Marty Schwab and The crooked i?s stance, you?re wrong. After all, he is one of our biggest advertisers?ha ha, no, seriously. He is. Marty?s a great guy and has a great little bar there. Yessiree. Sure does. Anyway, it?s the man?s business, and I fully support his right to do with it as he pleases. In fact, I believe there shouldn?t even be a law regulating smoking in bars ? I say we let the market decide. Vote with your dollars by patronizing the businesses most appropriate to your particular inclination, be it whiny non-smoker or inconsiderate smoker. Whiny non-smokers, you?ll love The crooked i even more than you already love it. And as I said above, there?s really no better live music venue of that size, that I know of, within at least 90 miles, if not 150, so inconsiderate smokers will always have a reason to go there. The crooked i will always have its place in Erie, and I, for one, will continue to wake up several afternoons each month with a headache, smelling like those Fat Elvis shots, ears ringing (but I?m never drinking that Agwa de Bolivia again). However, as the market dictates, and as people vote with their dollars, I hope Scotty?s always has its place in Erie as well, because at Scotty?s, inconsiderate smokers are not only tolerated, they are celebrated. If it?s been a while since you?ve been to Scotty?s, now is a good time to stop in and reacquaint yourself with the place. I remember the first time I walked in to this joint ? I felt like I had been there before. It?s small and dark and cozy, and that old wooden bar with the lighted cabinets makes me expect to see Lloyd, the bartender from ?The Shining? calmly state, ?Your credit?s fine, Mr. Torrance.? When that eventually does happen, I will walk right the hell out of there, but until then, I?ll be glad to see a non-ghost bartender, thank you very much, a non-ghost bartender like Mario the bartender, who is not a ghost but does happen to be the best damn bartender from Timbuktu to Portland, Maine. Or Portland, Oregon, for that matter. Mario more resembles a twisted magician than a bartender, complete with vest, tie, and arm garters, but I?m not going to give away any of his tricks. You?ll have to stop in to check out his act, but let?s just say he slings the drinks out with a little extra ?flair.? And that?s not to slight Scotty, the head ?caretaker? at Scotty?s, nor Ray, who are both highly capable mixologists in their own right. And at Scotty?s they have to be ? 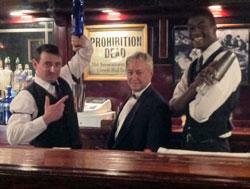 the martinis these guys serve up are much more than your next hangover staring you down ? they are bona fide works of art. I tend to lean towards the brown party liquor, so I?ve never had one, but they sure do look good. In keeping with the Prohibition-era theme, these guys also can make you all sorts of old-timey drinks if you?re ever interested in feeling what your great-grandparents used to feel like when they went out and tripped the light fantastic at the Gold Room in the Overlook Hotel. So ask Mario for a Sidecar. Or an Old Fashioned. Or an old Groaner. Or an Old Groaner?s Wife. Or an Old Nick. Or anything old. In this kind of place, shrouded in a speakeasy feel, I think this is what you should be drinking. Throw some Scatman Crothers on the jukebox, and you?ll feel like you could probably settle in for the winter. Sorry, I got a little off track again. We were talking about smoking. As I said, Scotty?s not only allows smoking, they encourage it. They?ve got a walk-in humidor in there, stocked with cigars, cigarillos, cigarettes, and all the accoutrements necessary to select the proper smoke for your drink, be it Scotch whiskey, or wine. I don?t know about you, but I?m not a fan of smoking cigars. I am, however, a fan of smelling them ? even as a cigarette smoker, I?m far fonder of the smell of cigars than I am of cigarettes, and I know many non-smokers who agree. There?s something calming, soothing, and comforting about the scent that lends itself to the atmosphere at Scotty?s. And as one of the dwindling options left for smokers who drink, or drinkers who smoke, Scotty?s is more relevant and vital than it?s ever been. So if voting with your dollars means spending more money at The crooked i, then do it. If voting with your dollars means spending more money at Scotty?s, then do it. There is room for Marty, and room for Scotty, and in the end, everybody wins. So vote early, and vote often. After all, you know what they say?All work and no play makes Jack a dull boy. No TV and no beer make Homer go crazy. What make you go crazy? Prince? Aerosmith? Patsy Cline? Gnarls Barkley? All of those can be found on the jukebox at Scotty?s. Or probably covered by somebody at The crooked i. Are you a dull boy (or girl)? Are you inconsiderate or whiny? Meet me at either of these places, and order me a Red Rum while we wait for Johnny.